The 2017-18 Canada West men's basketball all-star and all-rookie teams were announced by the conference on Thursday, February 22. The University of Manitoba Bisons had one student-athlete honoured for his efforts. Bison men's basketball guard Justus Alleyn (pronounced: Al-lean) has been selected as 2017-18 Canada West Men's Basketball First Team All-Star. This is the third consecutive season that a Bison has been named a conference All-Star (Keith Omoerah – Second Team in 2015-16; Alleyn – Second Team in 2016-17) and sixth time a Bison was a conference all-star in last 12 seasons ('06-07 and '07-08: Isaac Ansah – Second Team; 2012-13: Stephan Walton – Second Team). Alleyn, 22, finished his fifth and final season with the Bisons and earned his second consecutive conference all-star selection at Manitoba at the guard position. Alleyn had his best season statistically as he captured Canada West conference men's basketball scoring title with 24.1 points per game (PPG) and became first Bison to accomplish this feat in conference men's basketball regular season. The fifth year guard started in all 20 CW regular season games in 2017-18 season and was first Bison with this prestigious accomplishment of winning scoring title since the Herd joined Canada West in 2000-01 campaign. 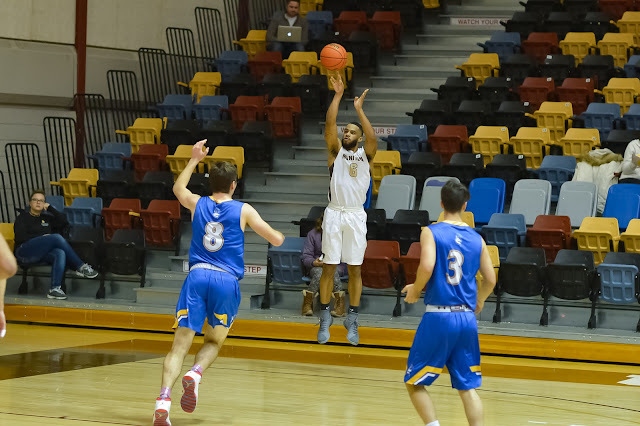 This season, the Montreal native was also co-captain for the second consecutive and in Canada West minutes played, Alleyn ended up third place at 35.6 plus finished fourth at 42.3% in Canada West 3-point percentage and Alleyn was also tied for ninth with 1.9 CW steals per game. In addition, the Arts student-athlete had a season-high of 35 points versus Victoria on Jan. 14/18 and scored 30 or more points in four CW games, scored 20 or more points in 13 of 20 games and had double digit scoring in all 20 CW regular season games in 2017-18. Bison head coach Kirby Schepp enthused, "A very well deserved honour to cap an outstanding Bison career for Justus. He will go down as one of the greatest to ever wear the Brown and Gold uniform. His worth ethic will leave a legacy on our program for years to come." Bison Notes: Alleyn also becomes the first Bison men's basketball player to earn CW First Team All-Star honours since the Herd joined Canada West in 2000-01.